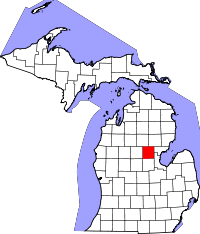 Gladwin County, located towards the northern half of the southern half of Michigan, is a fairly wooded and sparsely populated area. Both the Gladwin State Forest Area and the Gladwin State Park are located in the county, along with other forests and wildlife areas. The town of Gladwin is the county seat and is where genealogists and vital records researchers should go to investigate the area's records. The Genealogy Research area is located in the County Clerk at 401 West Cedar Ave., and is open on weekdays during normal business hours. Researchers are encouraged to call at least one week in advance to confirm availability; the office can also be emailed directly at countyclerk@gladwinco.com. Death, marriage, and divorce records are all available from 1875 to the present, and birth records are kept from 1875 until 1972. Out of County Death records are also kept from 1933 until 1990. Note: Office will fax back results for add'l $1.00 per page, prepaid.